I am well and truly fed up of the snow. I need a fix of sunshine and pronto. Also dare I say it I would love a holiday minus the kids. Just hubbie and I! Not having to worry that someone else is tired, hungry, thirsty, bored or hopping for the toilet after you have already told them to go!!! I love my boys but sometimes I crave a little me time. A holiday where I can be selfish and just meet my own needs and not listen to an endless barrage of complaints and grumbles. Or find myself trying to calm down over excited kids who can be slightly wild at times! Just a bit of peace and quiet, maybe a few cocktails and a relaxed pace of life for a week or two in the Maldives. We never had a honeymoon, I was pregnant when we got married. We even pulled the wedding forward as things happened so quickly! So, I don’t think I am asking too much wanting a proper honeymoon even if it is many years overdue! We could renew our vows, so I have a proper excuse to go away. Look how fresh faced we looked back then. I was only four months pregnant and still very optimistic not realizing quite how many years of sleep I would be missing or how tough parenting can be. I probably would feel guilty going away without the boys, but the last few breaks I have been slightly more tempted! They have been playing up and it would be such an indulgence not having to deal with their arguments and drama for a short while. Although knowing my luck once they got wind of the idea they would be trying to hide in our suitcase! Destination2.co.uk are giving away a honeymoon to one deserving couple over on their website. If you want to win a honeymoon in Mauritius, make sure you enter before the 31st of December 2018. Sadly, I think you need to be proposing in 2018 to be included, so that rules me out by about 10 years. But it doesn’t stop me daydreaming. If you can try and get away pre-kids, once they arrive holidays aren’t quite so tranquil anymore. Mauritius is such a dreamy destination, it really is such a lovely prize. I think we have earnt the right to renew our wedding vows, we have weathered years of sleepless nights, sibling arguments and now backchat. It would be great to head off just the two of us and remember why we got together in the first place. It’s hard you get stuck in a rut when your life revolves around the needs of the kids and you never make enough time for each other. I was looking at Destination 2 Luxury Holidays to find my perfect holiday in the Indian Ocean. Mauritius would be wonderful or the Maldives. 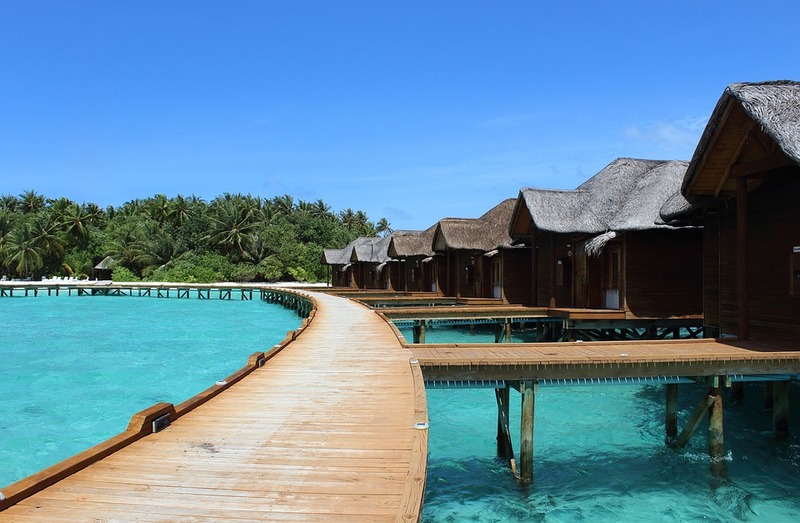 The thatched water bungalows there have caught my eye, such a beautiful spot right on the water. It really is a tropical paradise where you can even stay on a private island. It’s the ideal destination for romance, so idyllic. You can enjoy the spa and feel all your troubles drift away. I noticed that many of the resorts have kid’s clubs so if the boys did try and gate-crash they could make the most of those facilities even if it was just for an hour or two, so I could enjoy a cocktail in peace! If your looking for a bit of adventure you can go scuba diving too! So much marine life in the reefs they are well worth exploring. If you head to Manta Island you might even be fortunate enough to swim with the manta rays. Personally, on this trip though I would confine myself to the resort sitting on my private sun terrace, living in the moment. Not rushing off to see everything like we normally do on holidays with the boys.